This page provides information about vehicle and document requirements, state regulations, insurance coverage, and city-specific requirements, needed to drive with Lyft in the state of Colorado. Be sure to follow these rules when giving rides in Colorado, and keep an eye on your email for important updates from Lyft. If you're applying to drive in Colorado, see the application steps. All vehicles must be 2004 or newer, have 4 doors, and 5-8 seats, including the driver's. To be approved, your vehicle must also pass an inspection. Complete the inspection at an onboarding event, or ask your mechanic to use this form. 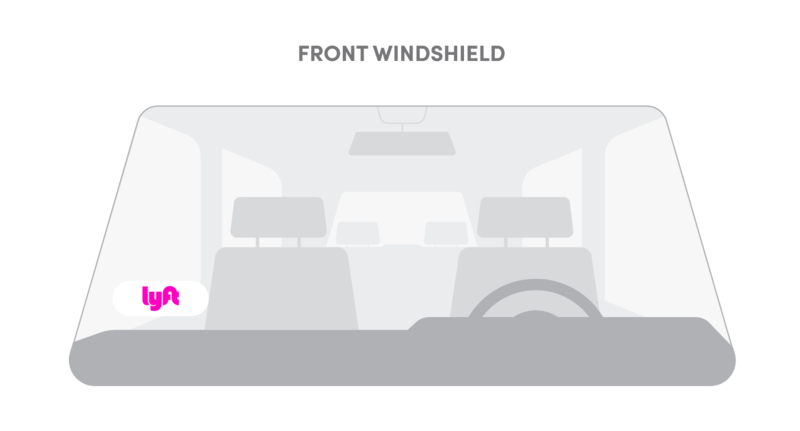 Keep a Lyft emblem displayed in the lower right hand corner (passenger side) of your front windshield at all times while giving Lyft rides. Select the temporary emblem below to open in a new window so you can print them out. Our emblems use a non-permanent adhesive, which can easily be removed. After you’re approved to drive, your Lyft emblems will arrive within 1-2 weeks. If you didn't get an emblem or need a new one, place an order in your Dashboard. You can also print a temporary emblem while waiting for the official one to arrive, or pick an emblem up at the Hub. Keep a Lyft emblem displayed at all times while giving Lyft rides at any Colorado airport. If you’re giving a non-Lyft ride at the airport, make sure to remove your Lyft emblem before entering airport property. View driving requirements for specific airports in Colorado. Drivers are required to maintain current documents. Failing to update a required document before the expiration date results in temporary deactivation. Use the Driver Dashboard to upload your documents up to 31 days before they expire. Lyft requires a photo of all drivers. Your driver photo is a passenger’s first impression of you when they request a ride. See tips for taking a great profile photo. Drivers are required to have a valid driver's license, which can be issued by any state. A temporary license is acceptable, but be sure to upload your permanent copy when you receive it. Vehicles must have Colorado-issued registration. Vehicle registration expires annually. Drivers are required to have personal vehicle insurance. Personal vehicle insurance plans vary, and must be updated before your policy’s expiration date. Drivers are required to have a vehicle inspection before becoming approved to drive, and at least annually thereafter. Keep a current inspection form in your vehicle at all times while in driver mode. To find an inspection location, schedule an appointment, or upload your inspection document, see the Driver Dashboard. If you attend an onboarding event, your inspection will be performed there. If you visit a mechanic on your own instead, have them use this form. Inspections may cost around $20-30 but vary depending on the facility. Lyft doesn’t cover the cost of annual inspections or inspections for existing drivers. 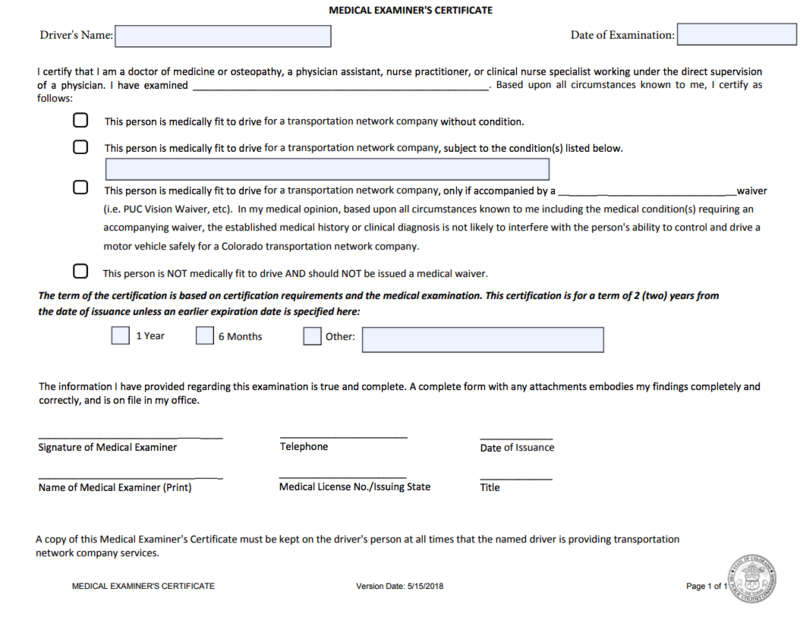 Drivers are required to pass a Colorado TNC Driver Medical Exam. Upon passing the exam, you will be issued a TNC Driver Medical Certificate. Keep the certificate in your vehicle at all times while in driver mode. If you attend an onboarding event, your medical exam will be performed there. Download and print the TNC Driver Medical Examination Packet. Bring the packet to a certified health professional (any MD, DO, PA or Nurse Practitioner) to have them complete it. Check the map below for a convenient location. Please call ahead and schedule an appointment with the clinic you're planning to visit. Fees may apply. Upload a picture of your new medical certificate in the Driver Dashboard. The Town of Telluride advises that drivers who reside there should obtain a business license. Learn more on the Town of Telluride’s website. Keep your business license in your vehicle in case the authorities ask to see it. It is the Town of Vail’s position that commercial operators are required to obtain a permit for each vehicle at least 30 days prior to each Transportation Year. Permits may cost between $25 and $50. Learn more on the Town of Vail's website. In Colorado, Lyft is regulated by the Colorado Public Utilities Commission (PUC). Spend a total of 16 hours in driver mode within one day. Drivers who reach this limit must take an 8 hour break. What happens if I drive for more hours than I’m allowed? If you drive more than the number of hours allowed by the PUC, Lyft will pause your account. If you continue to violate these rules, you may be permanently deactivated and are at risk of fines up to $2,500 per day. The Colorado Public Utilities Commission (PUC) randomly audits drivers for compliance. If you receive a ride request from a PUC Investigator, they will let you know once you arrive at their pickup location. Once you arrive at the pickup location, the examiner will cancel the ride and perform the audit. You should exit driver mode during the process. Lyft has a zero-tolerance drug and alcohol policy for drivers. Passengers are encouraged to contact Lyft's Critical Response Line if they suspect a driver is under the influence of drugs or alcohol; to contact us, click the "Call Me" button on this page. Lyft will immediately suspend the driver’s access to the app platform pending an investigation. In the course of a zero-tolerance investigation, Lyft will contact the passenger for further details relating to a suspected zero-tolerance policy violation. Prior passengers of a driver under investigation will be contacted if necessary. If an investigation results in definitive evidence or even a strong suspicion of a zero-tolerance policy violation, the driver will be permanently deactivated. Lyft also actively monitors passenger feedback for indicators of a zero-tolerance policy violation. When feedback has been flagged, the Lyft will review the comments and if the comments indicate that a violation of the zero-tolerance policy may have occurred, the driver will be suspended while the Trust & Safety team conducts an investigation. Lyft drivers are to provide services to the public in a nondiscriminatory manner, regardless of geographic location of the departure point or destination, once the driver and rider have been matched through the app. Our platform-wide anti-discrimination policy can be viewed in full here. You are required to immediately report to Lyft any refusal to transport a passenger after you have been matched for a ride if your refusal was based on discrimination due to the passenger's departure point, destination, race, color, ethnicity, gender, sexual orientation, gender identity or disability. It’s important to understand Lyft’s insurance policy in the event of an incident. We're opening Lyft Hubs across the country to offer in-person support for drivers. Your local Hub is a one-stop shop for answers on everything from setting up direct deposit to discovering where you’ll get the most ride requests. Locate a Hub in your area. Clear photos of your driver's license, vehicle insurance, and Colorado vehicle registration. If you already have Colorado vehicle registration on file with Lyft, you don’t need to send it in again. Also make sure your vehicle meets requirements for Colorado. If you’re moving from Colorado to a different state, find your new state to see what documents you'll need.